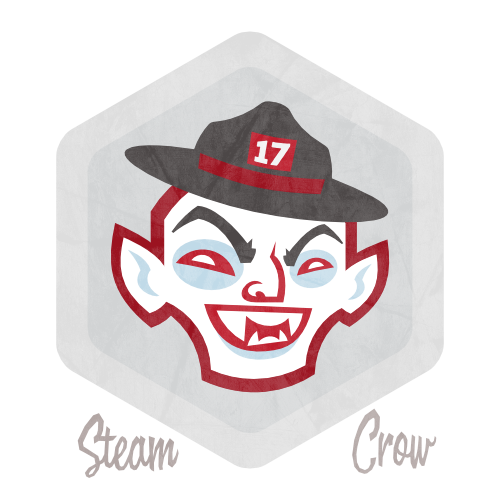 The Platinum Vampire Membership Badge shows that you were a top supporter of Steam Crow in 2017. This Spirit Badge was a featured reward for our 2017 Monster Scouts Membership Drive Kickstarter. Only 200 of these badges were created. The Platinum Vampire Spirit Badge is worth 100 Glory points. Vampires (Feratu) are regal creatures, cursed with living for centuries, drinking Manling blood, and going to really odd parties. But, they make really great Monster Rangers, and have shared their knowledge with us. This is an Ultra Rare badge. We pledge to Believe, Study and Protect Our Monster Friends! Monster Rangers collect badges, go on Monstro Camps, and hang out. CAW!